Thank you to all students who volunteered and took part in photo sessions for my latest series of articles for the agility magazine CleanRun - I always use student's dogs (or my own dogs) for all my magazine articles. The dogs and handlers whos photos will used in the March issue are: Gill & Decker, Zoe & Zircon, Clare & Tony, Gill & Pip, and Wenzhe & Bobby. If you want to get a copy of the article go to the CleanRun website where you can buy individual copies of the magazine. Those used in last June's article were Clare & Cherry, Tracey & Bailey, and Alex & Bella. And in my article the July 2018 issue the dogs and handlers where Barabara & Bonnie, Gill & Rolo, Shelby & Harley, Debbie & Jasper, and finally my Tabitha in the weaving with distractions photo. Thank you to all my students who nominted me for KCAI Trainer of the Year 2017, I really appreciate your support again this year, and I am delighted to have been contacted by the Kennel Club to let me know that I made it through to the shortlist this year. Please contact me on 07810 415 420 if you need to check your class time. 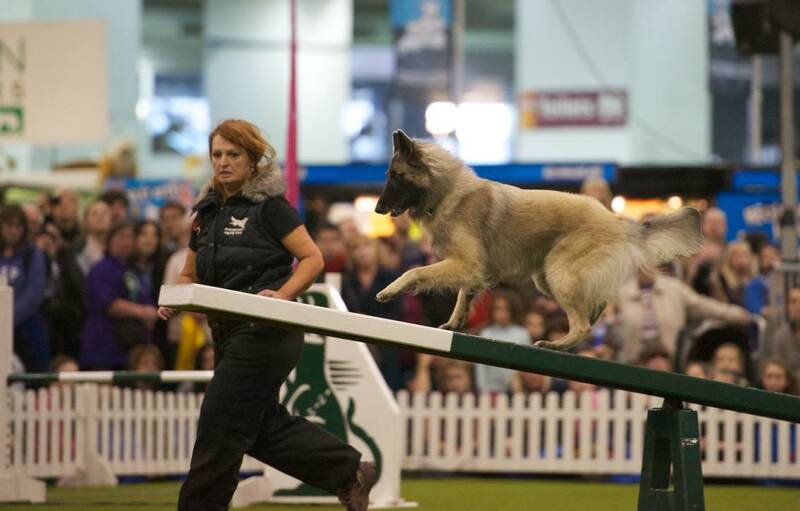 It is also easy for well trained behaviours, such as contact critera, to become unprofitable to your dog in an agility show environement - our dogs are fast learners and quickly make the distinction between training locations where they get rewards, and shows where they never get 'paid'. And if in the heat of competition the handler starts to change the performance criteria... things become quite confusing for the dog. 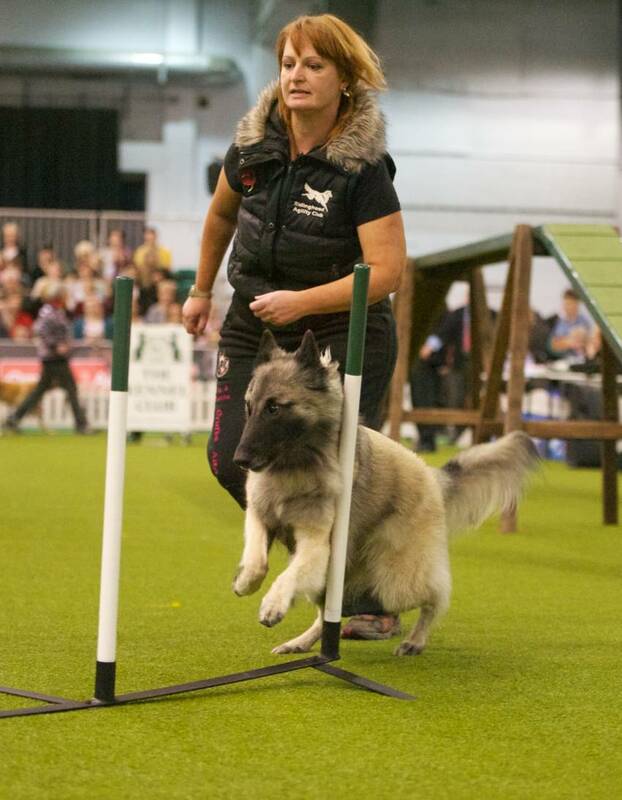 So if you want to compete it is helpful to bridge the gap between training and competing by putting you and your dog in a show environment and then doing some training with lots of rewards. Diversification of enviroment is very important when training agility dogs, which is why we encorage club members to utilise as many training opportuities in different locations as possible. Try to be consistant with the critiera that your dog has learnt in your lessons so as not to confuse your dog; we want our dogs to learn that agility location varies but the performance critieria stays the same, and if the critera is perfomed well you will pay (reward) your dog for a job well done. Whenever you get the change to do a NFC run with your dog make the most of your time allocation in the ring by deciding what your focus for each run is. Remember you don't have to follow the course set for those competing, so if you want to train weave pole enteries, but they are towards the end of the course, ask the judge if you can start three quarters of the way round so you will have plenty of time to train and reward your dog. If your are working on jumping skills break the course down into sections e.g. jumps 1-5 and reward for good performance, then 6 -10 reward. 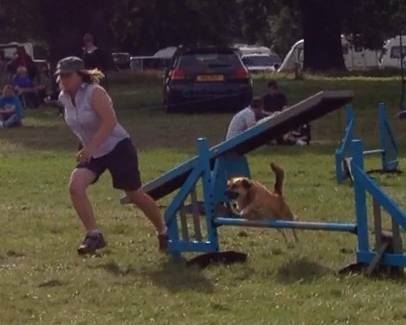 Look for things to reward, such as your dog working correctly past a trappy jump sequence, getting a hard weave entry, holding a great contact position whilst you do a run by (if your dog does static contacts)... most important of all have fun with your dog. A full range of clothing is availible to club members to purchase via the www.sew-what-uk.com website. The Ridinghood logo page will have a range of the most popular clothing, but you can order any item from the webiste - just specify 'Ridinghood logo' and the logo colour you require in the special instructions box. If you select a two-tone article of clothing and want to have the logo printed in the contrasting garment colour - as above specify 'Ridinghood logo' and the logo colour you require in the special instructions box. It is also possible to have items that you supply embroidered. BaseBall Cap have a slightly different logo; as pictured but using the acronim 'R.A.C' as the print area is slightly smaller and they couldn't embroider the full 'Ridinghood Agility Club' text clearly. 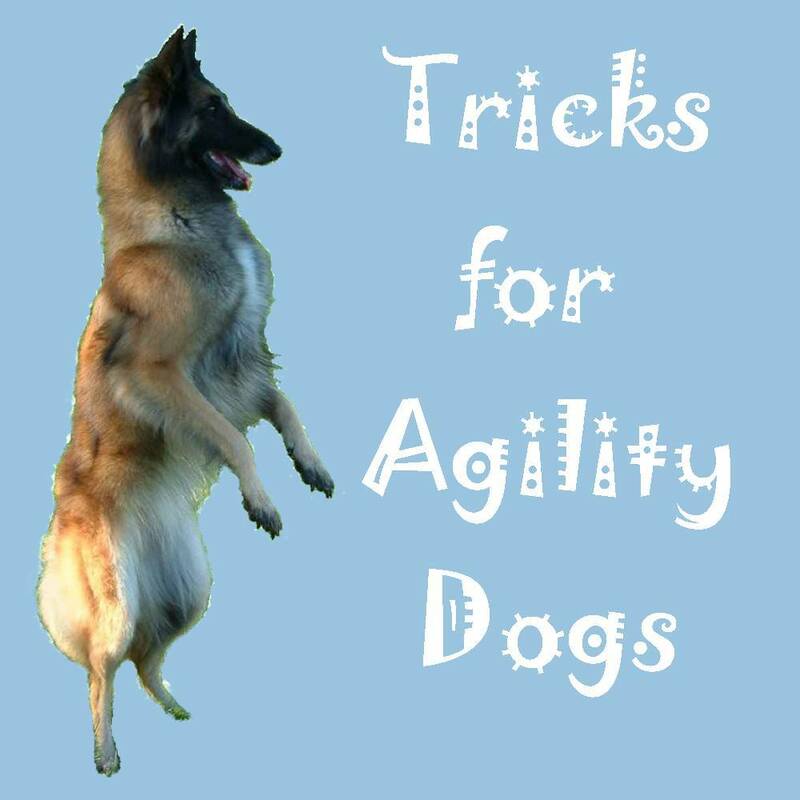 Loads of you have been asking for a trick training class, to give you some ideas of fun things to do with your dogs that will also help with their agility training, so I will run a class on Sunday 15th at 12.30 focusing on tricks that can be used for strengthening and active stretches. As it is sunday the farm gate will only be open for Parking in the stabl yard for a 10mins before the class. Alternativley there is parking in the lane. A fun evening exploring some of the ways dog's think and learn, and the amazing skills dogs have evolved to live and work in harmony with humans. Each dog will have the opportunity to take part in a series of games /tests adapted from recent scientific studies into the cognitive processes and behaviour of dogs. The evening will finish with the opportunity to teach your dog a fun trick, which utilises some of your dog's skills we will have highlighted in the games/tests, that will show your friends just how smart he is. Over the last couple of weeks several students have asked for me for advice regarding their dogs weight or general body condition and type of diet. I find the subject of dogs nutritional needs to be fascinating and an area of constant development and debate. So firstly some thoughts on the type of diet. The hot topic at present is the recent scientific research looking at the genetic changes that took place in the transformation of ancient wolves into domestic dogs. One notable change is extra copies of the enzyme amylase, which breaks down starch into sugars. Interestingly some of the changes seen in canine digestion are similar to adaptions that occurred in humans  increase in amylase is thought by some to have contributed significantly to human evolution by enabling humans to eat an alternative diet to fruit and meat (2) as we evolved from hunter/gatherers to farmers. For several years I have been interested in the different concepts such as BARF and other natural feeding programmes, which in general discourage the feeding of gain based foods (e.g. rice) to dogs, encouraging instead a diet of raw bones, meat and offal and a small amount of vegetables to replicate that of the dogs ancient ancestor, the wolf. There is also growing market of commercial dog kibble available which is promoted as biologically appropriate and do not contain grains or cereal. 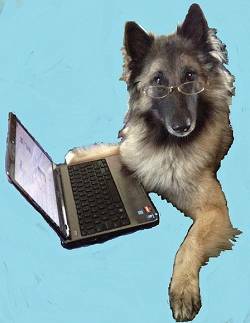 If the early proto-dog started scavenging around village dumps and eating starchy food scraps such as cereals and root vegetables, and the domestic dog has over the last 10,000 or more years adapted to a starch rich diet, is a carbohydrate free diet right for our dogs? If you are using a kibble dog food there is then the matter of preservatives to consider. Commercial kibble style dog foods contain animal fat, which will oxidise and become rancid and therefore manufacturers add preservatives to extend the shelf life of the food. These preservatives can be natural, made from vitamins C or E such as tocopherol . There are also a number of artificial preservatives that can be used, and considerable speculation surrounding the long term health implications of the use of those artificial preservatives. To complicate matters chicken and meat meal is often pre-treated with preservatives as part of the rendering process performed by the meat meal supplier before it reaches the dog food manufacturing plant. These do not get declared on the dog food packaging as the manufacturer did not add it to their product, making it difficult for owners to make informed choices. Canned or frozen foods are not usually treated with preservatives as it is the method itself preserving the food. So once you have dealt with the difficult and often contentious issue of what to feed your dog, you need to decide how much. For many years we have heard canine nutritionists defining the different dietary requirements of working dogs into categories based on the type of activities undertaken; Sprinters (less than 2min duration e.g. racing, lure coursing, flyball and agility) , Intermediate (ranging from a few minutes to a couple of hours e.g swimming, herding) and Endurance (many hours to days e.g. sled dog racing). 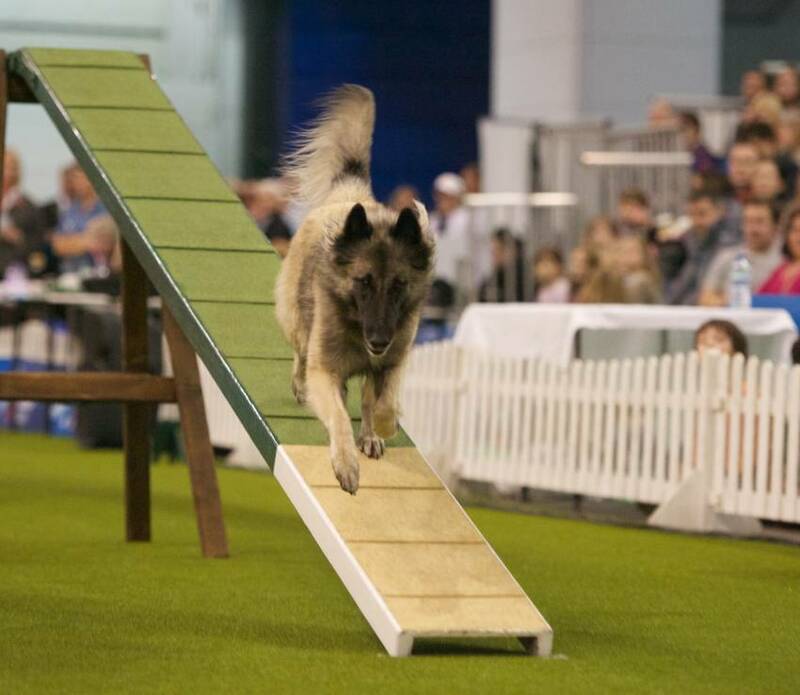 Agility dogs activities tend to fall into both the sprinter and the intermediate category - during a day competing, the dog undertakes a few, high intensity activities under 1 minute in duration. Whereas agility training sessions may take the form of intermediate exercise with dogs performing blocks of activities of training and tugging/playing as reward for several minutes at a time, interspersed with brief rest periods, for up to 1 hour. Short bursts of high intensity activity are anaerobic  fuelled by chemicals stored in muscle tissue. Intermediate exercise is aerobic  the process of carbohydrate oxidation and to some extent fat oxidisation creates fuel. All dogs nutritional requirements vary, and the feeding guidelines on commercial dog foods need to be adjusted to suit your dog. There are formulas available which enable you to calculate your dogs daily resting energy requirements and tailor it depending on the dogs age, whether or not the dog is neutered and its activity levels. However as few of us are able to identify the calorific value of the dogs food this rather scientific approach to dietary needs may be of limited practical use to the majority of owners, although calculating your dogs calorie requirement does give an insight into the amount of variance that occurs as a result of the individual status of each dog. 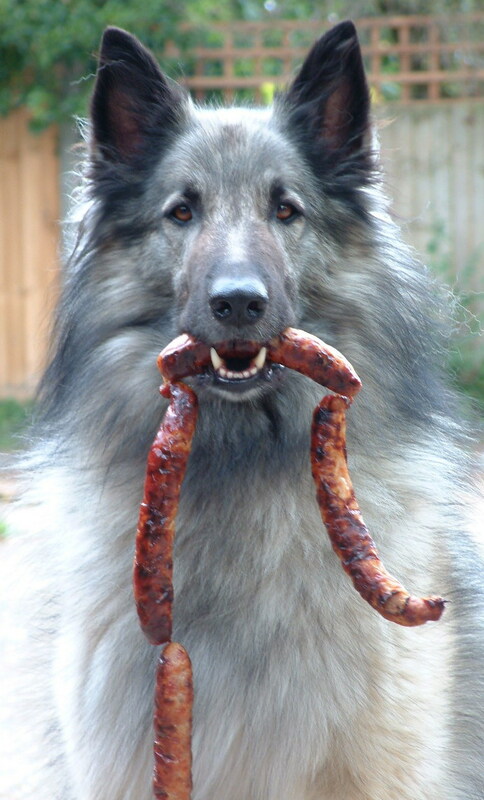 It is probably easier to keep your dog to an ideal body weight by considering the amount of body fat and muscle; areas such as the dogs ribs, loin (waist) and tuck up (belly) are all good indicators. For example your dogs ribs should be easily palpable and without an excess fat covering, your dog should have a clearly defined waist when viewed from above and should have an obvious abdominal tuck up when viewed from the side. I hope this article has inspired you to consider the nutritional requirements of your dog, and given you an appetite to find out more to determine the best diet for your dogs. 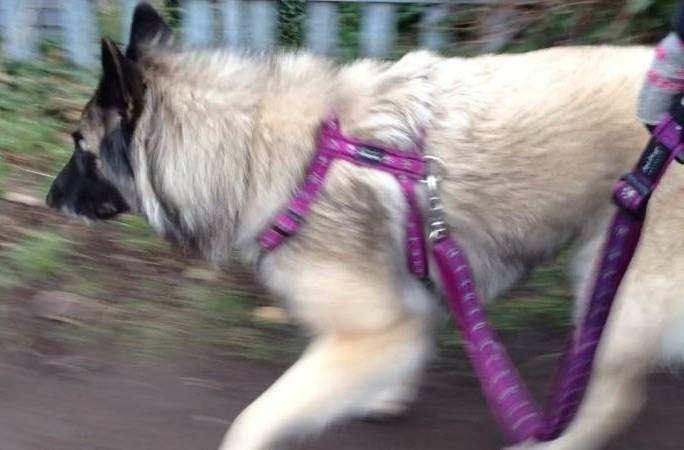 Help - my dog pulls on the lead! A workshop to help owners to train their dogs to walk with a loose lead. This is a two part evening, with a session for Dog Training Instructors to understand the training concepts needed to help students and their dogs walk in harmony, followed by a practial handler workshop with 10 handler places. 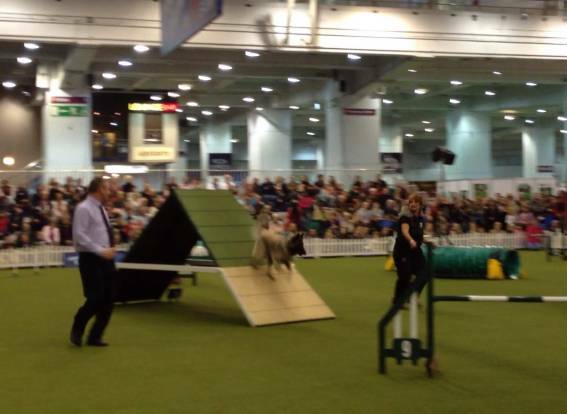 All year ABC (Anything But Collies) dogs have been competing for places in heats up and down the country. 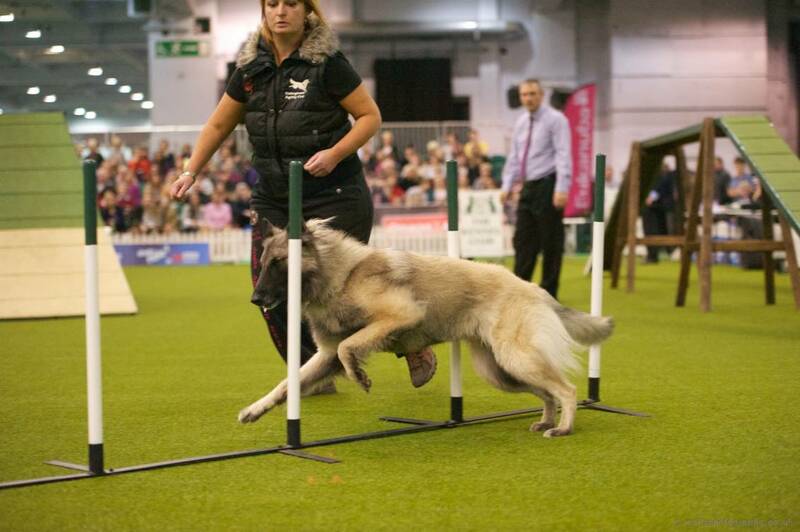 Only the top two of each breed were selected, Tabitha ranked 4th overall and was the top Tervuren (and top BSD). So Tig & Tabitha made it to Discover Dogs at Earls Court, Tabitha's first national event - thank you to everyone who sent us good luck messages and especially to everyone who came and supported us on the day. Thank you to Blue Cross Head Veterinary Nurse Tamsin Durston for the talk on First Aid for Dogs. 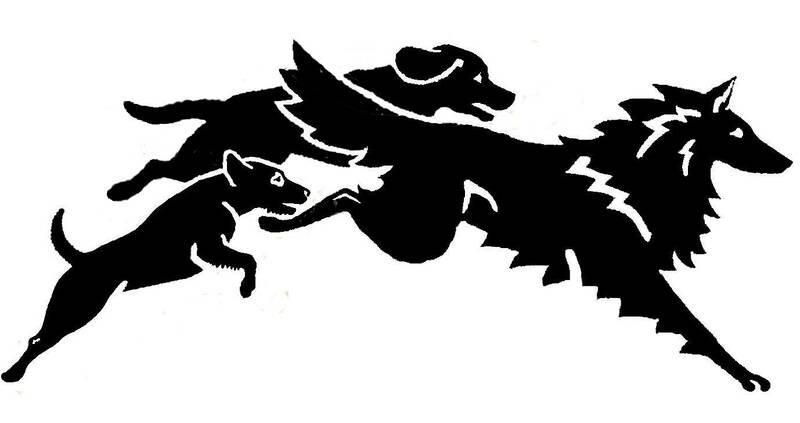 UKA run special 'Nursery' classes for new dogs that are ready to start competing. 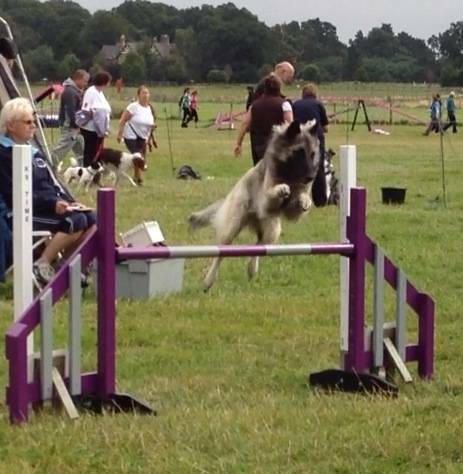 Nursery classes with have a slightly lower jump height and and all UKA competitions allow you to run 'Not for Competition' which enables you to train your dog in the ring with a toy - remember no food is allowed in the ring at shows. You will need to register yourself and your dogs, you can do this online, or at the show. 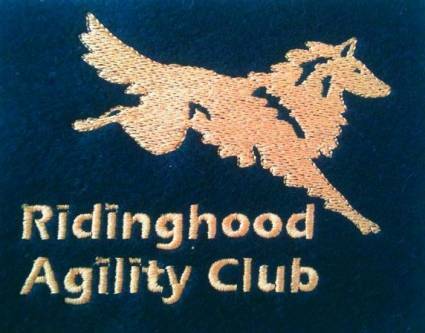 Usually a couple of familiar faces from Ridinghood Agility Club will be there and will be happy to help you with registrations and measuring and how to book in to classes etc. 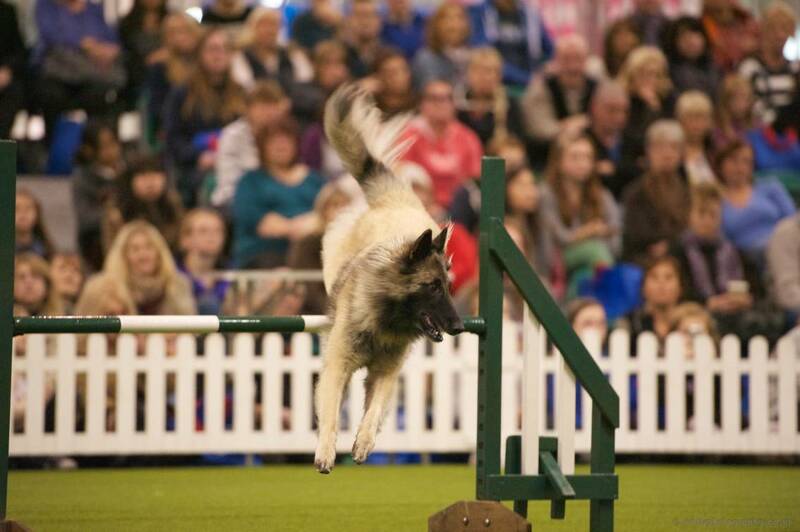 For more details and the rules look up UKAgility's website or ask Tig which shows we are attending.